Word of a new competitor on the wings captured investors' attention last month. 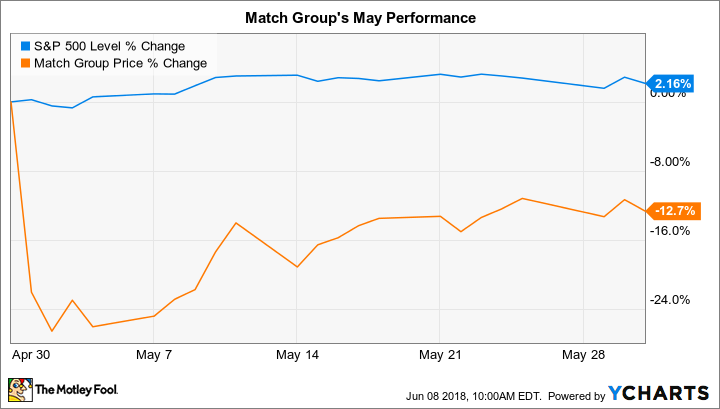 Dating app specialist Match Group (NASDAQ:MTCH) trailed the market last month, falling 13% compared to a 2% increase in the S&P 500, according to data provided by S&P Global Market Intelligence. The decline didn't do much to change the stock's broader trajectory. Match has more than doubled over the last year and is still in positive territory for 2018. Investors lost their cool early in the month when Facebook (NASDAQ:FB) announced plans to elbow into the dating market. The social media giant believes it has a good chance at growth here despite its late push into the industry, given that 200 million of its users list themselves as single today. It's unclear what impact this move will eventually have on Match apps like Tinder, Match, and PlentyOfFish. For now, though, the company is logging impressive growth, with sales up 36% in the most recent quarter, and operating margin improving to 28% of sales from 20% a year ago. Moves by competitors, even huge ones like Facebook, don't change Match's broader strategic approach. If anything, they add some urgency to its approach of increasing market share by improving its services. "We continue to deliver innovative products that customers across our portfolio of brands find valuable," CEO Mandy Ginsberg said in the days following Facebook's announcement. And in what could be a reference to the changing competitive dynamics of the industry, Ginsberg went on to say that management is confident that their upcoming product releases "will allow us to remain the clear leader in this category." Now it's up to the company to deliver on those goals.